I just moved to a new part of town and after thirteen years in the same city, visiting the same gentleman that cuts my hair, I thought it was time for a change. New neighborhood, new haircut, new attitude. 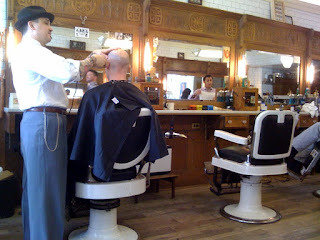 I found an authentic looking barbershop called FSC (Freeman's Sporting Club) at 5 Horatio Street. I wanted something a little different. He pulled out the clippers. "Is #4 good?" Barry asked with a northern English accent. Well, I now I have new haircut which is much shorter than my previous one and I like it. FSC is a gentleman's barbershop - there was talk of motorbikes mainly - not my thing, but we agreed on a few other things. And the hot towel on the face at the end was a calming, refreshing surprise that soothed me after a very long week. It's old school looking with a new, hip, cool attitude. I am going back.